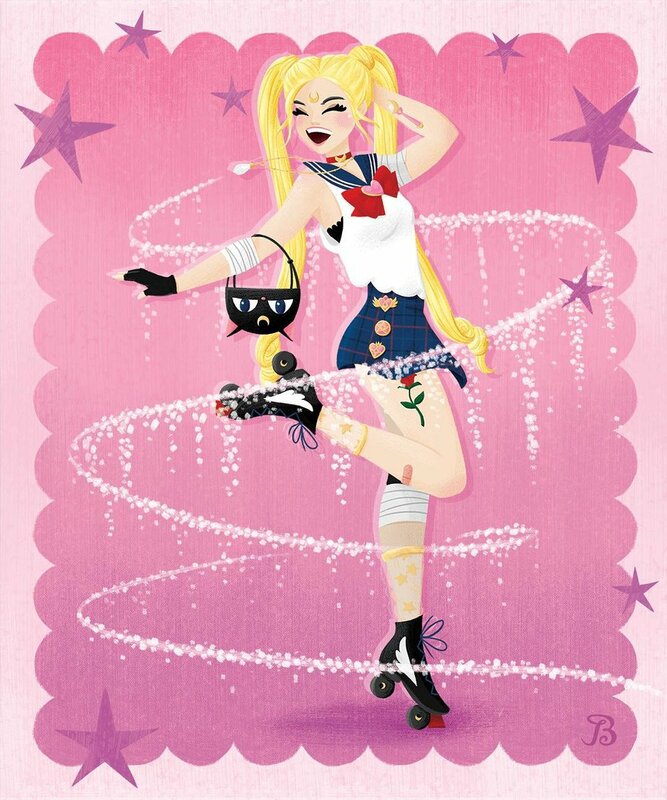 I originally found her work through her Roller Derby style Sailor Scout series (Sailor Moon shown above) and was amazed by her ability to not only capture the essence of these familiar characters, but all the while maintaining her own original style and flair + did you see the adorable style details of tattoo, buttons and handbag?! 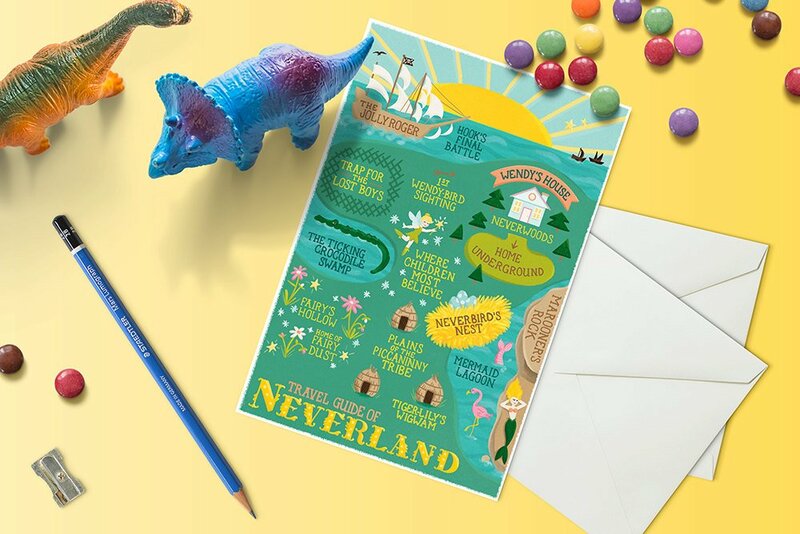 Her bright, fun color palettes and attention to the tiniest magical details really make Lainie’s work stand out among the crowd! Along with this peek into her process, journey and inspiration you’ll also get some amazing advice on diving into your passion project!! Enjoy and be sure to follow along with her: @lainie.bea.studio. Illustration is the one creative pursuit I can’t imagine living without. I crave it, even if I’m doing it only for myself. Honestly, it took me a long time to be able to share my work. I’ve been interested in art for as long as I can remember. When I was younger, I copied artwork from books and movies that I loved to learn from their style. 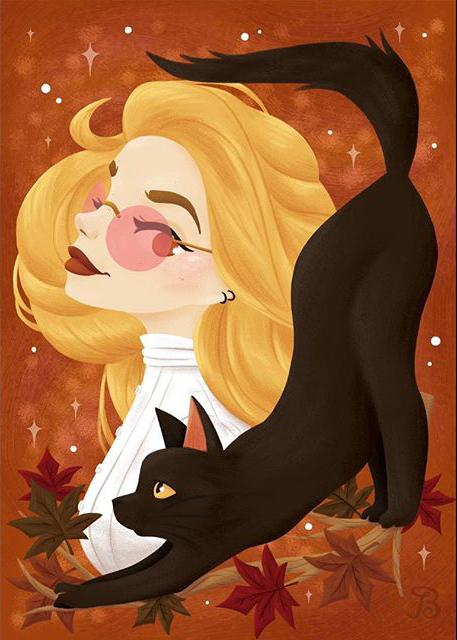 Even though I went to university for graphic design, I am a self-taught digital illustrator. I think people have the misconception that if you excel in one art form, you’ll immediately be amazing at every other one you try. I think it definitely gives you an advantage, but all of them present their own challenges and require you to approach them with a different creative mindset, which can be half of the fun. I think accomplishing certain types of projects would give me a feeling of success. It’s easy to get caught up in measuring the amount of followers, likes and shop purchases you receive in a day as how successful you are. It can be healthy to remember all that you have already accomplished and what you’d like to do next. One of my dreams right now is to collaborate with creative writers to help them illustrate some very fun and inspiring stories. I might always be chasing ‘success’ because, hopefully, there will always be an exciting, new project waiting for me to take on. Eventually, I would like to be able to devote more time to my artwork as a full-time illustrator. Presently, I work as a graphic designer, and I illustrate in any free time I can manage. It might sound slightly cheesy, but I’d really like people to see a piece of themselves in my work. I’d like to present a feeling or memory that people can relate to in their own way. In the end, I hope it gives people a sense of belonging. Hah. I think I’m still struggling with this one! I usually have self-assigned deadlines, so I have a general idea of when I need to have a project finished. But I’m not sure I ever really know when I’m actually ‘done’. Even now I have plans to revise some illustrations I’ve already posted. I think it’s especially difficult when you work digitally to not continuously look at your pieces to see what you could slightly alter and improve. I usually have to send proofs to a small, trusted group of friends and artists for feedback before I know if I’m ready to share the illustration on Instagram or in my shop. Luckily, as a digital illustrator my workspace can be wherever I have my laptop and Wacom tablet. I often find a comfortable space in my house where my two dogs can curl up right beside me. I’ve also taken over the guest room to store items for my Etsy shop, including prints and shipping materials. I try to keep this area clean and organized since I often need to perform quick assemblies to fulfill my shipments on time. I’m always struggling to find more time in the day! I often joke that if I could give up sleeping I would. I usually have many more ideas for potential projects than I have the time to work on them. It may sound strange, but I have a difficult time giving myself breaks, although working nonstop is an easy way to suddenly find myself in a creative block or rut. I have to remember that it’s okay to not do everything. Don’t rush it. Take some time at the beginning to decide how you want to present your brand. Choose what audience you want to connect with and the message you’d like to provide. It’s okay if all of this evolves once you’ve put yourself out there, but it’s nice to go in with a plan and a decent stockpile of ready to share artwork. Know that you don’t have to give your art away for free or “for the exposure”. Most people who ask this of you often don’t take you or creative work seriously (even if it’s your passion, you’ve put a lot of hard work, time, love, thought, sweat and tears into these projects). It’s okay, not everyone has to get it. In fact, it makes it more worthwhile when you do get the opportunity to work with people who really see your value. Lainie also sells prints and paper goodies through her Etsy shop: Lainie Bea Studio.